Water Garden offer high quality LED recess mounted deck and garden lights. Ideal for garden pathways, patios, driveways and water features. High quality LED recess-mounted deck and garden lights. All Deck Lights require connection to a transformer (not separately) and can be connected to our Plug and Play range of transformers, extension cables, timers and remote controls. 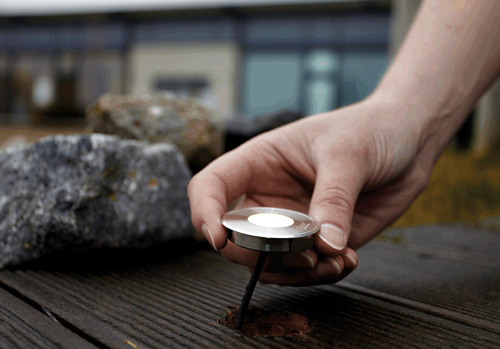 The lights are ideal for garden pathways, patios, driveways, water rills and water features. Recessed Deck Lights are a great way to highlight borders, patio edges, steps and feature walls. 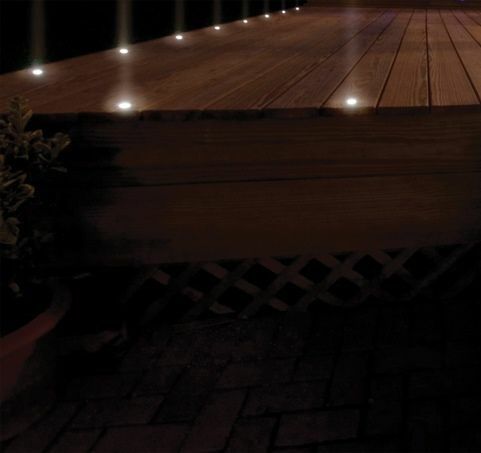 A highly practical use for deck lighting is to highlight potential hazards i.e. steps or drops such as a veranda edge. Deck lights are generally installed in a linear, symmetrical pattern equally spaced apart. Our deck lights coupled with our cable accessories allow you to create long chains of deck lighting all powered from the same single transformer. Our 10m & 15m Connection cables feature screwcap outlets equally spaced along the cable and can be further extended by simply connecting another 10m or 15m cable. Water Garden Ltd offer recessed mounted lights in warm white, cold white and blue. Our range offers energy efficient LEDs which only consume between 0.5 - 1 watt per light, whilst our Larger UltraLuxx LED lights consume 18 and 24 watts each and are more suited to larger gardens, landscaping or commercial installations. For an added effect the UltraLuxx RGB Recessed lights can be remote controlled allowing you to select a number of different colours, phases and brightness.